When renewable policies are in place, the mismatch between policy targets and lack of technology diffusion indicates a gap between codifying a policy and implementing it. In Switzerland, photovoltaic (PV) electricity is seen to play a major role in the future. Stakeholders’ opinions in the implementation of photovoltaic projects may block or delay the achievement of renewable policy goals. This paper explores the question: which are the main drivers and risks perceived by stakeholders at different levels of the government in the implementation of a pilot PV project? 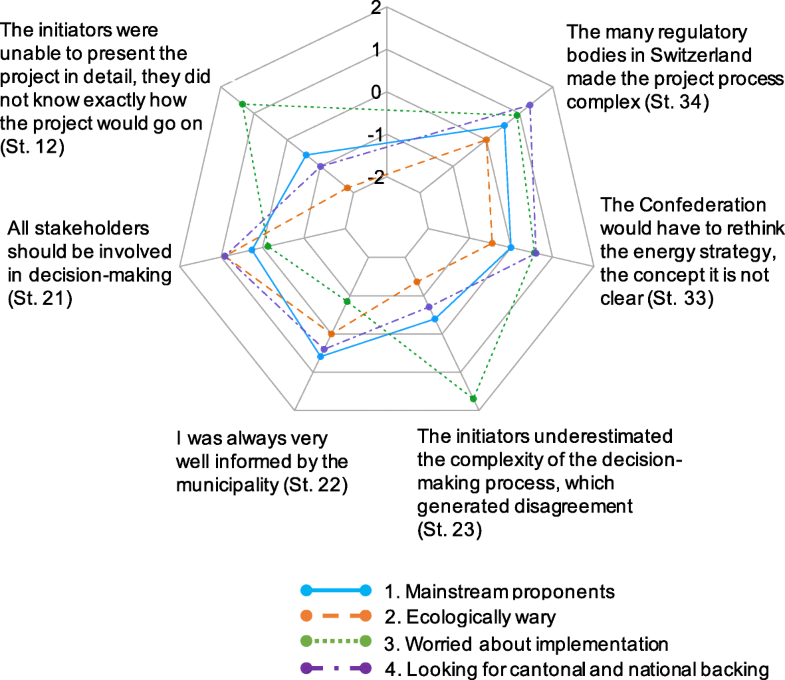 We study a decision-making process of a pilot project in the Swiss Alps to figure out which determinants explain the public opposition to such implementation. We study five types of determinants of public acceptance: economy, technology, environment, social aspects, and the policy process. We use Q methodology, which is especially suited to determine the different interests of stakeholders’ groups. Our results show four different perspectives: “Mainstream proponents,” “Ecologically wary,” “Worried about implementation,” and “Looking for cantonal and national backing.” The results indicate that the photovoltaics’ acceptance was highly driven by the potential contribution of the project to the regional economy. However, economy and technology determinants elicited both the highest and the lowest statistical consensus among perspectives (z-score). Our results point out the important role of initiators to maintain trust during the decision-making process. Finally, stakeholders in the photovoltaic project wanted to have fluent access to concrete information about the project and its future plans. Most of the implementation risks observed are determinants of acceptance related to economic aspects and the policy process. Characteristics of the decision-making process, such as trust during the process, affect the perceived outcomes of the project. Aspects of the decision-making process may, therefore, turn into risks for the project’s implementation. Results also suggest that techno-economic assessments are key drivers to fostering energy transitions, but they are not sufficient in themselves. Initiators have to consider enhancing communication since the early steps of the policy process, the intelligence and promotion phases to avoid implementation risks. The European renewable energy sector includes 40% of the total global solar photovoltaic (PV) installations. European governments envision continued expansion of PV capacity as an important means to decarbonize electricity supply. Support policies have always played a key role in Europe to incentivize further PV developments. PV is currently a mature technology, though its costs are still falling . However, adoption of PV differs substantially between countries, and the combined capacity of new renewables, including PV plants, remains low compared to fossil fuels . Various reasons have been identified for this lack of diffusion of PV, among which are variable energy policies and public support programs for renewable energies without sufficient guidance and direction to innovation (directionality failure) ; varying levels of liberalization of domestic electricity markets ; lack of coordination of concrete policy actions and initiatives between the activities of national, regional, sectoral, and technological institutions . Traditionally, policy makers have applied top-down decision-making processes shaped according to their preferences to develop electricity technologies. As Tversky and Kahneman  p. 453 explained, “the frame that a decision-maker adopts is controlled partly by the formulation of the problem and partly by the norms, habits, and personal characteristics of the decision-maker.” However, this frame may not align with the reality of policy implementation . Moreover, modern theories of decision-making recommend stakeholder engagement in decision-making as a tool to avoid public opposition to renewable developments [7–9], and good practices in the design of participatory processes seem to give more weight towards the desired outcomes of the process than the local context . According to the substantive rationale for stakeholder participation, stakeholders offer more realistic assumptions about the projects [11, 12]. For that to work, participatory processes must consider the diversity of stakeholders’ rationales, and use instruments for participation that fit the purpose . According to the instrumental rationale, participation ultimately allows reaching higher levels of consensus and compromise . Integrating stakeholder perceptions of energy policy codifications in decision-making is critical to improve the policy design and implementation, and to avoid public opposition to renewable energy infrastructure [15, 16]. On an aggregate level, implementing renewable energy goals looks like a continuous process, but this process is ultimately a function of many successive PV projects being successfully coordinated, directed, and completed. For these reasons, we contend that aggregate PV goals are not met due to barriers that stop individual projects from going forward. Some of these barriers may stem from inconsistent implementation of support policies . Understanding the decision process at a project level is therefore necessary to clarify the lack of success of energy policies to reach the planned goals , and it allows us to determine risks to implementation of individual renewables projects and aggregate goals. One of the main factors limiting the expansion of renewable energy has been public opposition to its physical infrastructure . Public opposition to concrete projects often takes policy makers by surprise because the technologies are new, and there was no reason to anticipate a lack of public support, especially when the ultimate goal of the development—reducing greenhouse gas emissions—enjoys high public support at a general level . Furthermore, public support or opposition often results from determinants that go beyond the technical details of the infrastructure in question, such as institutional, cultural, and psychological factors, see for example [21–23]. Decision-makers study public opinion as a tool to avoid opposition to renewable developments, and perceived risks are a major driver of such opposition. Different groups of people construct risks differently. This simple idea described in psychometric studies implies that experts value risks very differently than lay people during decision-making processes [24, 25]. Concretely, experts prefer objectively measurable expressions of risk (e.g., disability-adjusted life year), while lay people construct risk in a more complex way, as a combination of socially constructed determinants (value-laden). Risk researchers therefore distinguish between subjective (knowledge, value, attitudes, and beliefs) and objective (risks probability, intensity, damage costs, and frequency) construction of risk. As many stakeholder groups construct risks predominantly in a subjective manner, different perspectives on risks from stakeholders shape the decision-making and the project’s results [7, 26–29]. As we concern ourselves with stakeholder’s perspectives, this paper focuses exclusively the subjective perception of risks. Stern and Fineberg  recommend characterizing risks to fully understand complex decision-making processes that involve stakeholders with opposing interests. Figure 1 shows the decision-making process steps adapted from Lasswell , and the relevant determinants of public acceptance of renewable energy projects that we found in literature [21, 31–34]. The first step consists in the collection of information (intelligence), followed by the creation of agreement on what to do (promotion). This requires clarity on which groups benefit and which values are promoted by each alternative, in order to avoid unintended outcomes . These two steps should be done before clarifying and setting down the goals, norms, and instruments to be used (codification). The fourth step is the actual implementation of the codified policy, and allocates resources and people. People may still disagree on how to practically implement the policy in the fourth stage, particularly if their interests and values were not part of the agreement. By examining the determinants of disagreement in decision-making processes, we can better assess which aspects of the process are contentious. Applying policy studies to energy research, as Hoppe and Coenen  suggested, the framework in Fig. 1 can also be applied to the implementation of renewable energy projects. In this case, the four steps could be described as: (1) preparing a project proposal, (2) negotiating and lobbying, (3) obtaining permits and fulfilling other formal requirements, and (4) building infrastructure. We distinguish between two types of risks that appear in practice in different steps of the implementation process of renewable energy projects: implementation risks and consequential risks. Implementation risks are potential barriers to successful completion of a project. For example, barriers may arise in the decision process if generally agreed procedures are not followed (i.e., perceived procedural injustice), or key actors’ values and interests are not sufficiently taken into account . Consequential risks arise when the project causes perceived negative outcomes. For example, a project that leads to economic losses or environmental pollution. Both types of risk, implementation or consequential risks, can cause delays, force adjustments, or outright block an energy project. Ultimately, these risks can prevent a policy from being implemented, or even written into law (codified). As we have seen, the decision-making process is complex. It is important to distinguish implementation and consequential risks in each of the steps of the decision making process, to enable a precise response to the difficulties that may emerge during the different steps in the process of the implementation of the PV technologies. Researchers have usually studied public opposition to renewable energy technologies with a focus on either implementation risks or consequential risks separately . There is a lack of understanding on how implementation risks may affect consequential ones, or vice versa. For example, stakeholders may come to worry about potential economic losses (consequential risk) as a result of a non-democratic decision process that has made them suspicious (implementation risk). In addition to that, researchers have studied economic risks much more than any other determinant . Consequently, there is a lack of study of political, social, technological, and some environmental determinants. We argue that risks for the acceptance of renewables must be studied with a method that allows a holistic comparison of perceived risks. Most of the literature about perceived risks for the implementation of infrastructure of renewable electricity studies isolated steps of the decision-making process . Usually, studies examine perceived risks during the codification and implementation steps of renewable energy decision-making process . However, as we show in Fig. 1, the determinants of acceptance can be identified already in earlier steps of the decision-making process, in the intelligence phase. 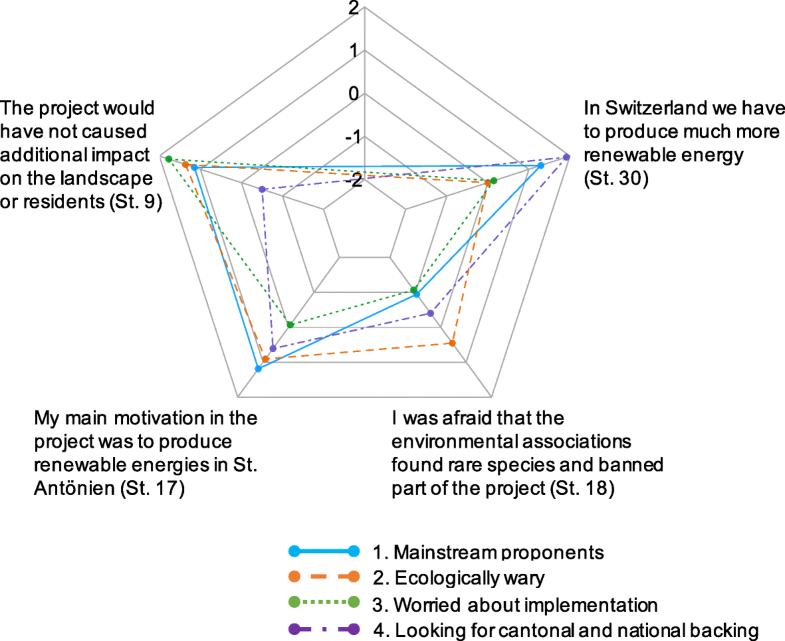 To demonstrate this, we study the stakeholders’ perspectives that emerged during the decision-making process for a pilot PV project in an alpine mountain region in eastern Switzerland. We chose a PV project because PV technology is intended to play a major role in the current Swiss Energy Strategy 2050 and also in decarbonizing electricity supply in many other countries. We selected a PV project in the Swiss Alps because PV technology is especially suited to contribute to the sustainable development of mountain regions for several reasons: First, they receive 50% higher irradiation per square meter than lower territories, and therefore produce electricity more consistently . PV panels are also more efficient in mountains, because the cold air reduces their operating temperatures. Second, electricity generation could be a new source of income in those regions that are currently losing population, and consequently economic activity. Third, mountains face extreme weather conditions and natural hazards that affect their economy. However, the infrastructure to mitigate these hazards is also an opportunity for generating income. For example, PV panels can be installed on top of avalanche protections to generate solar electricity. Despite these advantages, mountain regions in Switzerland have not seen implementation of PV projects, even with support policies in place. We therefore seek to understand the perceived risks that may hinder PV developments specifically in mountainous regions [40, 41]. Concretely, we explore a case study in St. Antönien, in the eastern Swiss Alps to answer the research question: which are the main drivers and risks perceived by stakeholders at different levels of the government in the implementation of a pilot PV project? We aim to identify stakeholders’ priorities of risks perceived in a decision-making process of a PV project. To approach the research question systematically, we gathered and classified drivers and risks of public acceptance according to criteria already existing in relevant literature [21, 31–34], and associated the risks to the steps in the decision-making process where they may emerge. We classified the perceived risks into five categories of determinants of public acceptance: social, technical, economic, environmental, and political. In doing so, we obtain the determinants that affect the deliberation, development, and results of PV projects. Knowing the risks for PV projects is necessary to design the successful implementation of energy policy goals. We used Q methodology to obtain perspectives of groups of stakeholders that emerge from individual stakeholder narratives [42–44]. The method is especially suited for our purpose because it accounts for priorities within the set of variables, i.e., we can learn whether stakeholders are more worried about implementation than consequential risks, or vice versa [33, 45]. These variables are concrete determinants of public acceptance, to characterize implementation and consequential risks. In this paper, we first describe the most relevant information related to the energy policy and the case studied in the Swiss alpine region under study (“Case study: PV panels on avalanche protections in the Swiss Alps” section). We then explain the Q method, which we use to examine stakeholders’ perceptions and the interrelation among determinants and risks (“Methods” section). Our results show perceptions of risks and determinants that generate disagreement or consensus (“Results” section). We discuss our results (“Discussion” section), and conclude with insights and recommendations for decision-making processes in the field of renewable energy policy (“Conclusions” section). The first energy article in the Swiss constitution (1990) mandates the federal government and cantons to ensure an economical, efficient, and ecological supply and use of energy . Since then, numerous instruments have been introduced, and sometimes phased out, to accomplish energy policy goals similar to those of today: increase production of renewable electricity, specifically growth in PV; reduce electricity consumption; stabilize CO2 emissions; and increase generation of hydropower [47, 48]. Policy implementation requires cantons and private organizations to cooperate in the promotion of policy instruments [49, 50]. In addition to legal instruments, the Federal Council and cantons run publicity programs to advise and inform interested parties, sensitize on energy topics, educate specialists, and promote innovative projects. There are three kinds of policy instruments: voluntary, regulatory, and market-based. The Swiss government has traditionally not applied regulatory instruments, such as banning the use of specific energy sources, in its energy policy [49, 51]. Subsidies have been one of the main instruments used in the Swiss energy policy, as seen in its Energy Law (2016) (Chapter 4 “feed-in tariffs” and Chapter 5 “subsidies on investment”) . Switzerland has provided feed-in tariffs and investment subsidies for new plants since 2009, with the aim of promoting electricity production from PV, small hydropower, wind energy, geothermal energy, and biomass and biological waste. The government currently levies a tax on electricity to finance the feed-in tariffs for renewables . Arguing falling costs of PV installations, the feed-in tariffs were discontinued for new PV in 2017 . Despite these policies, there is still little experience in Switzerland with the implementation of non-hydropower renewable infrastructure compared to other European countries. Evaluations of policy instruments in the early 2000s have concluded that stakeholders have a major influence in the success of the measures, and that communication was insufficient during implementation [54, 55]. Stakeholders’ positive engagement in the decision making process surrounding renewables projects is important, as the Swiss political system of direct democracy is highly participative. However, existing planning procedures do not always guarantee proper stakeholder engagement in renewable energy projects . Recent policy instruments have similar aims as in the past, but the current goals are quantitatively different. In September 2016, the Swiss Parliament adopted the Swiss Energy Strategy 2050. The new energy law that implements the energy strategy was promptly challenged in a national referendum but upheld by voters in May 2017 . Switzerland aims to increase the generation of domestic (non-hydro) renewable electricity from the current 5% to at least 20% of the electricity currently consumed. Solar PV generated about 2.3% of Swiss electricity in 2016 . Despite the low production, it is seen as the future dominant new renewable electricity source in Switzerland. This is, among other reasons, because wind power has low potential due to Switzerland’s mountainous topography [59–61]. The new Swiss energy law includes instruments to boost the implementation of new renewable electricity projects , but this accelerated development may give rise to adverse public opinions that may delay or stop the implementation of renewables projects. The use of mountain regions as sites for solar or wind facilities is one of the recent evolutions in rural landscapes. Experts see the development of a minimum level of infrastructure and network development in remote regions such as the rural Alps as a means to maintain these regions’ spatial cohesion, and to generate economic and social development in locations with lower population density . However, development of projects in remote regions incur higher costs due to the more extreme conditions and higher exposure to natural hazards. To circumvent this, PV projects on avalanche protections are considered in Switzerland, as these can take advantage of existing infrastructure . One such proposal emerged in St. Antönien, a village of 370 inhabitants in canton Graubünden in the east of Switzerland. Graubünden is the biggest and most sparsely populated canton, and has 90% of its territory above 1200 m altitude, which allows the canton to produce about 20% of Swiss hydropower. The idea of using the avalanche protections as support for solar panels came in 2010 from a frequent visitor to the village, the founder of a national energy company specialized in solar power. Three national electricity companies and the municipality of St. Antönien initiated the design of the project. They organized meetings with several cantonal administrations and environmental organizations, as well as three to five municipal assemblies per year, according to the information obtained in the interviews. The total extent of the avalanche protections was 12.5 km at 2400 m altitude, which could host 3.5 MW and generate 4500 MWh/a, enough electricity for about 1200 households . This would be the biggest solar project in Switzerland to date, unprecedented in its type. The initiators started to design a pilot project of 0.8 MW, equivalent to electricity for 280 households. The residents accepted the project in a municipal assembly with 49 votes in favor and 0 against. In 2011, the initiators built a test installation as a research and pilot plant construction. In September 2012, the Expert Commission on Avalanches and Rockfall pointed out the lack of scientific studies or experiments of large-scale solar systems on avalanches. In an assessment, they alluded to possible adverse effects of the solar panels on the protection of people and property in extreme weather situations . The commission formulated technical and financial criteria to reduce possible damage, and stipulated its use. Also in 2012, the initiators submitted a request to co-finance a half of the initial investment costs for the pilot project of 0.8 MW from the special national fund for innovative “pioneer” projects. The Swiss Federal Office for Energy did not agree with the pioneer status of the project, and the federal government rejected the subsidies 1 year later . During 2014, the electricity companies and the municipality launched a campaign to sell green electricity certificates. The action gathered funds from 230 private persons and industrial unions from the neighboring villages. Together with the initiator’s own funds and additional borrowed capital, this covered 85% of the budget for the initial phase. The Office of Energy of the Canton of Graubünden subsidized a further 2.5% of the initial phase. The municipality of St. Antönien planned to procure the remaining 15% with a large crowdfunding campaign. To be able to connect the solar power station to the grid in autumn 2016, the initiators needed a final loan from the municipality. In April 2015, the municipal assembly of St. Antönien rejected the loan with 25 votes against and 15 in favor. This decision signified the end of the project. The votes against surprised the city council, who did not expect a rejection of the project after the efforts to secure funding. The specific reasons for the rejection have not yet been studied in detail so far, and we provide this in the following chapters. The first step to select the case of study was the identification and selection of a group of four renewable energy projects of technologies that the Swiss energy strategy has decided to foster: wind power, hydropower, and photovoltaic. In a previous study, we have published the results related to a small hydropower plant . The selected wind power project was canceled by the initiators. From two photovoltaic projects, we selected the PV pilot project in St. Antönien because of its synergies with rural development policies. Furthermore, the St. Antönien project had a long decision process and involved a large variety of stakeholder groups. The issue was well-covered by local and regional newspapers and the national TV. Like any decision taken at the municipality level in Switzerland, the decision process of the PV in St. Antönien was open to all residents. The residents were highly participative in the process, which means we gather risk perceptions from a variety of interests (electricity companies, small business-like hotels and shops, residents, environmentalists, etc.). Moreover, the innovative idea of building PV panels in avalanche protections provided a novel case of study that allowed us to gather information on subjective risks perception for innovative developments, perceptions that may have not been previously studied. We use Q methodology as it is especially suited to determine the character and range of perspectives in complex decision process involving different interest and stakeholder groups [8, 42, 43, 67, 68]. Previous studies have used Q methodology to clarify groups of opinions about renewable energy technology and policy adoption [33, 66, 69–75]. In Q methodology, the researcher collects a broad set of statements from interviews, media, and other sources to ensure wide and representative coverage and balance of the topic studied [43, 45]. Each stakeholder then builds his/her own perspective of the topic by prioritizing the statements under a value scale. Finally, the researcher factorizes each stakeholder response, the so-called Q sort, and analyses the results. The goal of factor analysis here is to reduce the total number of perspectives, factors, from a unique perspective for every stakeholder to only a handful. The resulting stakeholders’ perspectives reveal the salient elements of their opinions, which may be interpreted as different policy alternatives themselves . Q method emphasizes the diversity of the participants, whose opinions may otherwise not be reported [43, 45]. The focus of participant selection is not on a large sample number, but instead to account for a wide variety of thoughts. We wanted the stakeholders in our case to inform us of risks for the implementation of the Swiss energy strategy in general and the St. Antoniën PV project in particular. Before proceeding with the selection of participants, we therefore identified all possible stakeholder’s roles and interest, following Bryson  recommendations. We then built a matrix of interactions following [7, 76]. In order to identify the stakeholders in the St. Antönien project, we first contacted key informants referred to us by the Swiss National Science Foundation. After the initial contacts, we then followed a snowball sampling method, i.e., relying on the recommendations of other stakeholders, to identify 43 people involved in the decision process of the solar PV project in St. Antönien. We categorized them in six broad stakeholder groups (Table 2 and Fig. 2). After analyzing and identifying stakeholders, we explored the discourse surrounding the topic of implementing PV projects. We gathered information from direct and secondary sources, on all varying and conflicting aspects. We used information from six extensive semi-structured interviews with local stakeholders, press releases [65, 77, 78], mass-media reports [39, 79–85], scientific papers , books , and technical documents from the federal commission for avalanches [28, 64, 74, 87]. We paid special attention to create statements with an appropriate language, in keeping with the principle of self-reference and natural digressions , particularly appropriate when dealing with stakeholders from various backgrounds. We collected statements until we reached the saturation point, which is emphasized in Q methodology over the number of participants, according to the principle of representative design [42, 88]. We initially collected 211 statements, and elaborated an analytical framework according to the topics emerged. We followed similar approaches as in previous studies, which counted for determinants of public acceptance [28, 66]. We then narrowed down the initial 211 statements, according to their similarity to our determinants, to a comprehensive and manageable sample of 34 statements (N = 34). This synthesizing operation has been used in previous Q studies . Table 1 shows the three topics and five qualifiers of our analytical framework. They describe the domain of the PV project. The project would probably have been worthwhile if other factors had been included, such as tourism, not just the revenues of energy production. If I have to pay much more for solar power than for conventional electricity, I prefer not to do so. Building the power line for the solar project would have been too expensive. The PV project in St. Antönien could have been a model for solar systems over avalanche defenses in Switzerland. If more solar panels could be built (3.5 MW instead of 1 MW), the costs would not have been a problem. It is not suitable to have any additional use in the avalanche defenses. The test installation was good for the project, because it showed that the solar system can withstand heavy snowfall. The engineers have underestimated the difficulties. Since the solar system was planned for existing avalanches, there would be no additional impact on the landscape or residents. Our village, St. Antönien, was too small to realize such a project. Local residents know best what the community needs. The initiators were unable to present the project in detail; they did not know exactly how the project would go on. The project lost the pioneering character because of the delay in getting the grant. The financing activities, such as the sale of certificates and crowdfunding, were successful. They worked too slowly; it led to rising costs. For me it was a warning when the electricity companies stepped out of the project. My main motivation in the project was to produce renewable energies in St. Antönien. I was afraid that the environmental associations found rare species of plants or animals up in the mountain and said that the power lines could not be built. We could have made an ecological contribution; our region could have significantly gained value. In the course of the project, I was insecure. All stakeholders should be involved in decision-making. I was always very well informed by the municipality. The low agreement at the end of the project process was largely due to the fact that the initiators underestimated the complexity of the decision-making process. It would have been easy to sell the solar power produced in St. Antönien. I am sure that the electricity producers are currently having big financial problems and will not give any bank loans for electricity projects. The canton should have supported the project financially. I think the planned nuclear phase-out of Switzerland is wrong. In Switzerland, we should improve energy efficiency (equipment, roof insulation). In Switzerland, we have to produce much more renewable energy. The energy transition will not be so easy to implement; there are too many people and lobbyists involved. Local interests are enough taken into account at national level. The confederation would have to rethink the concept of the energy strategy because at the moment it is not clear. The many regulatory bodies in Switzerland made the project process complex. This section covers the main relevant steps regarding statistical procedure [42, 43, 45, 67]. After sampling the 34 final statements that covered the topic of the PV project in the Alps, we requested the 43 stakeholders to distribute the statements according to their personal preference, the Q sort. We used a normal fix distribution from 4 to − 4, where 4 represented the statements “most like my opinion” and − 4 the statements “most unlike my opinion.” Later, 19 (44%) stakeholders answered from October to December 2016, using the Qsortware online tool . In addition to the Q sort, all stakeholders answered questions about their preferences, reasons to choose the extreme statements, whether they were forced to place relevant statements in the middle of the distribution (0 neutral zone), and whether they found some statements non-understandable or missing. We asked these questions to better understand the single perspectives and facilitate the final interpretation. Finally, we analyzed the 19 Q sorts with centroid analysis and varimax rotation, using PQmethod software . We used three rules to select the final number of factors. First, the Kaiser-Guttman criterion, or an eigenvalue greater than one, meaning that at least one participant loads significantly in the factor [91, 92]. Second, we followed Humphrey’s rule I, according to which, in our case, the factor needs at least two factor loadings higher than ± 0.442, at a significant level of p < 0.01. Third, according to Humphrey’s rule II, the cross product of the two more significant factor loadings had to exceed twice the standard error, ± 0.34 in our case. According to this criterion, four factors were extracted, shown in Table 2. The factors captured stakeholders’ perspectives on the broad set of 34 interconnected statements. Any Q sort, i.e., stakeholder, with a single rotated factor loading in excess of the significant factor loading (in our case ± 0.442) is said to load significantly because he or she exemplifies the perspective of the particular factor. As shown in Table 2, one participant loads significantly in more than one factor (ID 19). This Q sort is considered confounded, and is excluded from the analysis. The analysis results in four different factors, or perspectives: (1) mainstream proponents; (2) ecologically wary; (3) worried about implementation; and (4) looking for cantonal and national backing. Figure 2 illustrates the participant composition of each of the four factors. Participants in each factor prioritize different statements with respect to the PV project, the decision-making process, and the energy policy. They also rank several statements similarly, which are known as consensus statements. Interestingly, participants with the same background are spread in different factors, meaning that there is no alignment among them, or strong interest groups. It has an eigenvalue of 5.3 and explains 28% of the study variance (Table 2). Members considered themselves very well informed by the municipality during the decision process (statement 22 in Table 1). They also think that the financing activities, such as the sale of certificates and crowdfunding, and the test installation was successful for the PV project [7, 14]. Their driver in the project was to produce renewable electricity in the village, and they agreed with the nuclear phase out [17, 28]. These drivers are in line with the aims of the energy strategy. However, in their view, the energy strategy will not be easy to implement because many interest are involved . It has an eigenvalue of 2.1 and explains 11% of the study variance (Table 2). Members think that the initiators presented the project in detail, and they felt secure during the decision process (12, 20, 23). Although in their opinion that the test installation was good to avoid impacts in the landscape, they were slightly afraid that an environmental association could find some protected species in the area and could ban the project [7, 9, 18]. They assert that if other revenues such as tourism were considered, the project would probably have been worthwhile . It has an eigenvalue of 2.3 and explains 12% of the study variance (Table 2). Members think that there was low agreement at the end of the decision-making process because the initiators were unable to present the project in detail and because engineers underestimated the difficulties [8, 12, 23]. In their opinion, building more solar panels would not have reduced the costs, because selling the solar power from St. Antönien would not have been easy [5, 24]. The financial activities, crowdfunding and green certificates, were successful, but the delay in the process increased project costs [14, 15]. It has an eigenvalue of 1.8 and explains 9% of the study variance (Table 2). The most important aspect for its members is that local interests are not enough taken into account at national level . They do not understand why neither the confederation nor the canton supported the project financially [26, 27]. They are convinced that Switzerland has to produce much more renewable energy . They attribute the failure of the project to the small size of the village, but they think that a bigger PV project would not have reduced sufficiently the costs [5, 10]. In their view, all stakeholders should be involved in decision-making, although the project process was complex because of the many regulatory bodies in Switzerland [21, 34]. Participants in all perspectives showed consensus on some statements. Regarding the Swiss energy policy, they agreed in general that Switzerland should improve roof insulation and the energy efficiency of equipment (statement 29, Fig. 4). They also claimed that all stakeholders should be involved in decision-making (statement 21, Fig. 7). However, they also assert that the concept of the energy strategy is not clear (statement 33 Fig. 7). 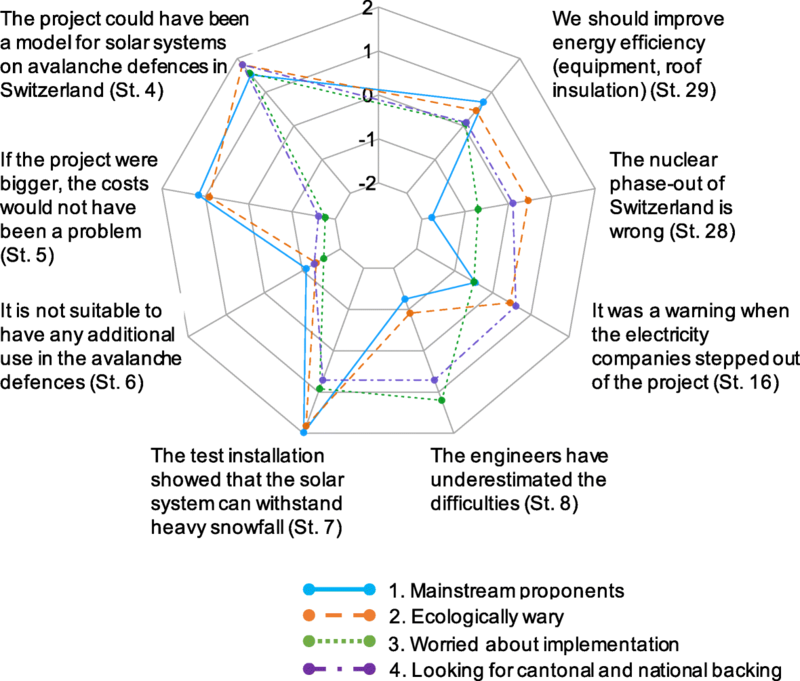 Additionally, all participants agreed that the PV project in St. Antönien could have been a model for solar systems on avalanche defenses in Switzerland (statements 4 and 6, Fig. 4). The project would have also contributed ecologically and economically to the region (statement 19, Fig. 6). In their view, building the power line for the solar project would not have been too expensive, and they did not understand the lack of financial support from the confederation (statements 3 and 26, Fig. 3). There was disagreement as well, and below we analyze how the participants prioritized the statements in each perspective, following . We present the results in groups of determinants: economy, technology, environment, social aspects, and features of the decision process (Fig. 1 and Table 1). In first place, Fig. 3 illustrates how the participants in the four perspectives agree or disagree with the statements grouped under economic determinants. The results suggest that participants’ opinions largely differ with respect to the economic statements. While there is consensus in the cost of the power line, and the lack of financial support of the canton and the confederation (statements 3, 26, and 27), there is no consensus among perspectives in any of the other economic statements. Aspects that generate most disagreement are related to the total cost of the project; the influence of other activities over the final costs, such as tourism; the willingness of the consumers to pay more for solar power than for electricity from other sources; the increase of costs due to delay in the decision process; and the success of financing activities, certificates and crowdfunding (statements 1, 2, 13, 14, and 15). Results tend towards neutrality in three of the four perspectives in relation to how easy it would have been to sell the solar power, and on the idea that the electricity producers are having financial problems (statements 24 and 25). Our data suggest that participants perceived very differently whether the project would have had economic problems once built, but it did in part due to delays and lack of federal support. There is disagreement on exactly what caused the economic case for the project to be insufficient. Figure 4 shows how participants in the four perspectives agreed or disagreed with technology statements. Perspectives showed disagreement in many of the technology statements. Disagreement was strongest on whether building more solar panels the project could have been more profitable, and how well engineers estimated the difficulties (statements 5 and 8). The phase-out of nuclear  is clearly supported by half of the perspectives, while the rest expressed neutrality. Efficiency in buildings and equipment  did not drive agreement or disagreement, but rather uncertainty or neutrality. Participants agreed that the project could have been a model for solar systems over avalanches for the whole country. They also think that the infrastructure for avalanche protections was very suitable for the solar panels, and their installation would not cause any additional impact (statements 4 and 6). Participants seem to be mostly split on whether the project was too small or too difficult, but nobody seems worried about the technical possibility of building PV panels on avalanche protections. Figure 5 shows how participants in the perspectives agreed or disagreed on environmental statements. The results show frequent consensus in relation to environmental aspects. Specifically, all participants ranked from neutrality to strong agreement on the need to increase the production of renewable energy, either in St. Antönien or in the country (statements 17 and 30). One perspective showed some concern about a possible project ban in case one NGO found special species, while the rest did not express this view (statement 18). Most of the participants agreed that PV on avalanche protection would have not caused additional impact on the landscape or villagers, but participants in one perspective were skeptical about that idea . The origin of this skepticism may be that these participants distrusted engineer’s capacity to anticipate difficulties. While half of the perspectives prioritized environmental concerns over energy production, only one prioritized energy production, although they stated that the project could have caused some environmental impact (statements 9 and 30). Environmental impact to the landscape is not perceived as a risk, and the contribution to produce renewable energy is prioritized. Figure 6 illustrates how the participants ranked the statements related to societal determinants. Participants disagreed whether the size of the village was too small for the solar project (statement 10). Not all participants felt security during the decision-making process. Most of them thought that local interests are not enough accounted of at national level (statements 20 and 32). Participants did not clearly position themselves regarding whether local residents have the best knowledge about community needs, and whether the energy strategy will be difficult to implement because of the many interest and lobbies involved (statements 11 and 31). On the other hand, all participants agreed that the region could have gained in value thanks to the project (statement 19). Our data suggest disagreement in that the local interests are accounted at national level, a situation that may translate in implementation risks. However, our result identified a driver in that most participants feel that such projects contribute the region positively. Figure 7 illustrates the z-scores of agreement and disagreement of the participants in the four perspectives with the statements about the decision process. Discrepancies in opinion were strong in relation to the role of initiators and the information provided by the municipality (statements 12, 22, and 23). All except one perspective largely agreed that the initiators clearly communicated the project’s plans, and that the municipality informed them well. Factor 3 attributed the low agreement at the end of the decision-making process to the fact that initiators underestimated the complexity of the process. On the other hand, the results show consensus in fostering participation (statement 21). Finally, participants ranged from neutrality to agreement that the confederation should explain the energy strategy because the concept is not clear, and that the many regulatory bodies in Switzerland made the decision-making process complex (statements 33 and 34). The major risk identified for the policy is that the energy strategy is a complex process. We found two elements that may create implementation risks: (1) lack of insight on part of the initiators into stakeholders’ aims, and therefore what information they need to develop trust in the initiators and the project, and (2) low stakeholder participation. The consensus statements we find are important aspects of the decision-making processes, because they represent the common ground for negotiation [26, 66, 94]. In the St. Antoniën case, the consensus statements represent drivers under the definition given by Hoppe and Graf : “reasons that citizens have for initiating local energy initiatives.” The results indicate that participants were highly driven by the prospect of the project to contribute to the community’s economy, and to be a model for solar systems on avalanche defenses. The project’s potential contribution for the regional and local economy was found to be the major driver for stakeholders to engage in the implementation process. These drivers match the “inverse NIMBY” theory, providing reasons why people living close to renewable energy projects are the most supportive [96–100]. Consensus statements also indicate that a lack of perceived environmental impact was a driver of support of the project proposal. This result matches previous studies that indicated that environmental impacts are not a barrier for the development of PV in mountain regions . Overall, the drivers highlight the importance of understanding the project’s regional context to plan a successful implementation. Our results show that stakeholders perceive implementation and consequential risks that concern economic aspects of the PV project. The results also indicate that the decision-making process plays a role in how stakeholders perceive economic risks. Our findings show that economy and technology determinants elicited the highest and the lowest statistical consensus among perspectives (z-score). This suggests that economy and technology cover a complex discourse. On one hand, participants perceived consequential economic risks differently. For example, while some thought that a bigger project could have reduced its costs sufficiently, others were reluctant to believe that the project’s size could have made it profitable. Two participants’ perspectives thought that sales of the solar electricity produced in St. Antönien would not cover investment costs for the project. On the other hand, concerning implementation risks, all participants were worried about rising costs during the decision process and unsuccessful funding activities. These risks are probably inherent to any pilot project. In previous literature, economic risks are usually related to the outcome of the project , but our results show that the project initiators should pay attention to the perception of costs increase during the decision-making process itself. Only half of the perspectives agreed with the capacity of the electricity company and the local administration to initially estimate the technical difficulties of the project. Participants generally felt a lack of concrete techno-economic information, which is especially remarkable in the perspectives that think that engineers underestimated difficulties (factor 3: worried about implementation and factor 4: looking for cantonal and national backing). This finding points out that the participants who perceived a lack of information also distrust the project. Participants wanted accurate information relative to their specific needs. Lack of information that they felt was relevant may have generated a lack of trust, which may in turn have increased opposition to the project, and eventually led to an opposing vote in the municipal assembly. This finding also points to importance for project initiators to maintain trust during the decision-making process and avoid creating unnecessary implementation barriers. Previous research has also pointed out that decision-makers would benefit from using scientific information from prior experiences in the codification phase . From the pilot PV project in St. Antönien, we learn that enhancing the way information is presented to stakeholders may help increase trust on the project and decrease perceived implementation risks, which may ultimately enhance public support . When information is not available in pilot projects because of a lack previous research (intelligence phase), as was the case in St. Antönien for perceived consequential—economic—risks, then our results show that policy goals should include the design of communication strategies, tailored for specific stakeholders. Our results also show that the concept of the national energy strategy was not clear for the participants, and they thought the national government should clarify the concept. This is a relevant finding given that the study was conducted during the campaign for the referendum that led to the approval of the current energy law . As written, the Energy Strategy 2050 includes clear policy goals and timing for achieving them. However, the confederation should more clearly communicate the concept of the energy strategy, as this gap in public knowledge seems to be a barrier to its implementation. Moreover, participants had diverse opinions that conflict with the main objectives of the Swiss energy strategy. They were divided on nuclear phase-out. Opponents did not want to increase domestic renewable energy production, partly due to their expectation of having to pay more for the electricity bill. This perception is similar to the arguments in favor of the referendum to abolish the Energy Law . The participants in St. Antönien generally agreed with the energy efficiency measures, which are also part of the energy strategy. Nevertheless, our results suggest a lack of commitment to two of the four main goals of the energy strategy: nuclear phase-out and increase of renewable electricity production. Although our results derive from a specific setting, the alpine mountains, other studies involving a larger fraction of Swiss residents have also found that voters prioritize substantial different electricity futures . In that regard, our findings also match the electoral results of the referendum about the energy strategy. We see in the election’s results that people were split in their support for the energy strategy. These contrary views match positions that political parties held during the campaign for the referendum . Under social determinants, all participants expressed that the federal government did not sufficiently look after local interests. Participants were concerned with the low support received from cantonal and national entities, although the canton financed 2.5% of the project’s initial phase. Some participants wanted more cantonal subsidies. Results suggest that the decision-making processes must include stakeholders’ values and interests for a successful project implementation, and the policy process in St Antönien was participative and democratic according to all participants. However, participants recognize that increasing the number of people involved in the PV project would increase the complexity of the process. 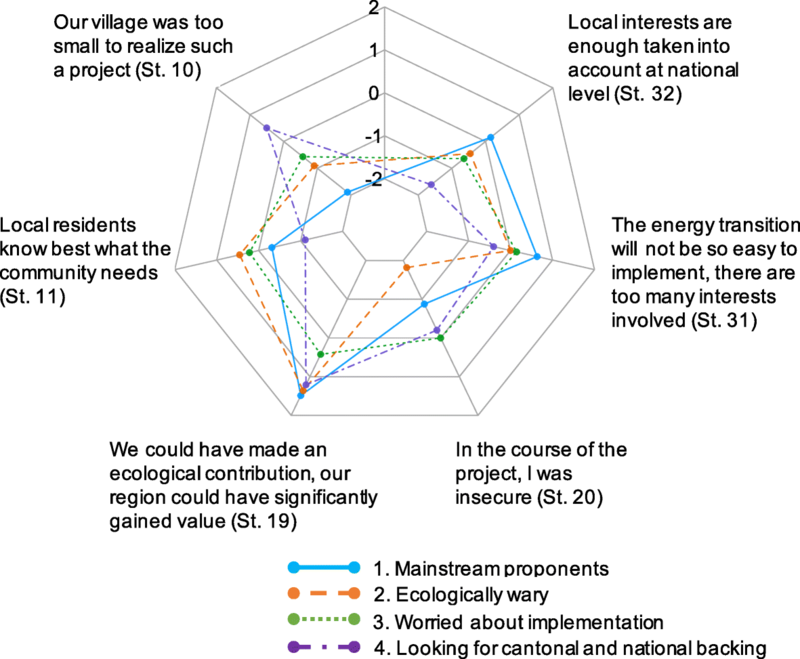 Participants in our study perceived that an excess of stakeholders may make it difficult to reach a consensus to build the PV project in remote mountain regions, rather than facilitating it. Good practices during implementation processes are therefore decisive for acceptance of renewable energy policies [104, 105] but inclusivity in decision-making process may have an optimum number of stakeholders that allows both real participation and proper implementation . Likewise, the numerous administrative bodies in the federal system are barriers to the easy implementation of the photovoltaic project, though each administrative body by itself has a sensible reason to be involved. From our results, we derive that increasing good practices during the promotion and codification phases of the decision-making process would likely lead to higher stakeholder understanding and trust . Participants in this project wanted to have fluent access to concrete information about the project and its future plans. Initiators have to consider this aspect from the early steps of the project’s process, the preparation of a project proposal, negotiation, and lobbying. Distrust in the project’s initiators affect the stakeholders’ cost-benefit assessments; meaning that characteristics of the decision process affect the perceived outcomes of the project. For example, our results show that perceived implementation risks in part result from lack of quality of information during the policy promotion and public campaigns. These results contribute to a better understanding of previous research that point out cost-benefit as the main determinant of acceptance . The findings also show the influence of the characteristics of the decision-making process over the outcome of the process (i.e., policy process, technology and economic determinants). The decision-making process may ultimately benefit from addressing the concrete goal of the stakeholders. Overall, this could accelerate and facilitate the implementation of renewables projects, the major goal of the Swiss Energy Strategy 2050. This is especially required in Switzerland, where civil society has ample opportunity to engage in decision-making. Switzerland has set an ambitious energy strategy to increase the level of domestic renewable electricity production. Among the available options, PV stands out as the most developed new renewable electricity technology. We have studied a decision-making process of a PV project over avalanche infrastructure in an alpine region. 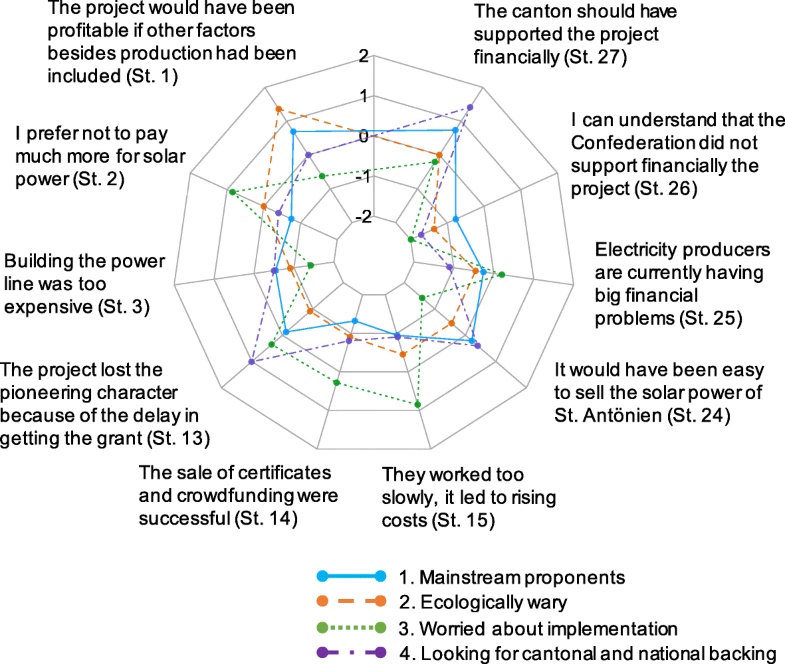 In this paper, we answer the question: which are the main drivers and risks perceived by stakeholders at different levels of the government in the implementation of a pilot PV project? In so doing, we provide a wide range of possible stakeholders’ perspectives that can explain the success or failure of diffusion of PV projects in mountain regions. We acknowledge that the validity of our results may be limited to remote regions, such as alpine mountains, experiencing a decline in population and economic activity. We categorize the risks that may hinder the development of such projects into the main determinants of public acceptance, and analyze them according to their type, i.e., implementation or consequential risks. Our results show that most of the implementation risks observed are determinants of acceptance related to economic aspects and the policy process of the PV project. For example, insecurity about the information received is a principal cause of controversy among stakeholders. Project’s costs, the amount of subsidies, and the profitability of the project are other relevant perceived risks. The large number, the complex structure, and the functioning of the administrative bodies are another implementation risk. To address this risk, the Swiss Federal Office of Energy is currently trying to shorten and simplify the approval for new installations to produce renewable electricity by providing a single point of contact. The Swiss Federal Office of Energy additionally needs to focus on set instruments to clarifying the concept of the national strategy. Instruments may also explain how citizens can support the implementation of the strategy. This may be done by intensifying outreach programs like EnergySchweiz at a regional and municipal level. When it comes to consequential risks, participants perceive consequential economic risks differently, meaning that there are contrasting perspectives on economic viability of the PV project. The lack of environmental impacts is an important condition for the implementation of the photovoltaic project in remote mountain areas. Likewise, the economic value gain for the village was a driver to support the PV project. Perceived economic and environmental gains are therefore indicators to be used in the promotion and codification phases of the policy implementation. It is also noteworthy to consider that, generally, participants do not perceive consequential technical risks. This suggests sufficient faith in local capacities and skills, which makes sense as citizens in alpine regions have developed a high capacity to adapt the landscape to minimize consequential risks in case of natural hazards . Currently, the Swiss Federal Office of Energy has set clear goals, one of which being the diffusion of renewables. We argue that the development of photovoltaic project in an alpine region could provide for more synergies between two federal offices. On one hand, the Swiss Federal Office of Energy has set the goal to increase photovoltaics. On the other hand, the Swiss Federal Office for Spatial Development has among its goals the better coordination of settlement, transport and energy infrastructure to strengthen the diversity, solidarity, and competitiveness of Switzerland. Supporting photovoltaics in mountain regions could be a measure to promote competitiveness and solidarity while producing electricity. Such photovoltaic projects on avalanche protections could be replicated in various mountain regions with similar characteristics, and contribute to political goals of both federal offices. The drivers and risks elicited in this study suggest two main policy recommendations to foster PV developments in mountain regions. First is the need to design inclusive decision-making processes that are adapted to the stakeholder’s requirements and perceptions to better achieve the energy policy goals [66, 103]. Second is a need to go beyond the discourse about the energy strategy at a national level and focus on their compatibility and synergies with regional and local needs and opportunities. Communication strategies need to be reinforced during promotion and codification phases of the decision-making, as these phases are crucial to avoid the development of implementation risks, before strong opposing coalitions and lobbing groups solidify. Communication strategies have to target precise groups with specific concerns, to address stakeholder’s perceived consequential risks. We also think that tailored campaigns that focus on groups of stakeholders with specific perspectives may reduce implementation risks and help reaching policy goals. These are communication strategies the federal administration could take advantage of. The federal administration could strengthen coordination between federal ministries, as well as between federal, cantonal, and municipal organizations. This could ultimately speed up decision-making processes and facilitate integration of regions and smaller communities into a national strategy. Our findings illustrate the complexity of the decision-making process in spite of the positive public attitude to PV technology. Future studies could link the local perspectives, like the ones we found in St Antönien, to aggregate perspectives held at a national scale. This could clarify how national messages can be adapted to link to interests and values that are held by local stakeholder groups, both for tailoring political advertisement and for substantive policy strategies. Another avenue for future research concerns investments. Despite overall grid parity, there is still a need to reduce capital costs and access for small (pilot) projects to demonstrate the potential of innovative solutions that serve multiple (separate) policy domains. A further line of research could analyze how the decision making process itself affects risks perception and the development of implementation risks. This research project is part of the National Research Programme “Energy Turnaround” (NRP 70) of the Swiss National Science Foundation (SNSF). Further information on the National Research Programme can be found at www.nrp70.ch. The authors wish to thank Lukas Bühler, Carolina Adler, Jonas Jörin, Leonhard Späth, Theresa Knoblauch, and Anthony Patt for constructive comments on the design of this study. We would also like to thank all stakeholders that participated in the study. All data and materials used in this manuscript are stored at ETH Zürich and are available upon request, within the limits of privacy regulations and ethical research standards. PD completed the literature review, interviews, data analysis, and the writing of the manuscript. OvV assisted with the writing and interpretation. Both authors read and approved the final manuscript.